I am always amused with the diligence in which Gothamist covers New York’s neurotic (and absurd) food trends. As of late, there has been extensive coverage of the Cronut, but on Friday they mentioned the Ramen Burger being sold at Smorgasburg this weekend. I was intrigued, but as the Ramen Burger is quite a meaty item (not to mention I am terrible at successfully eating at Smorgasburg. 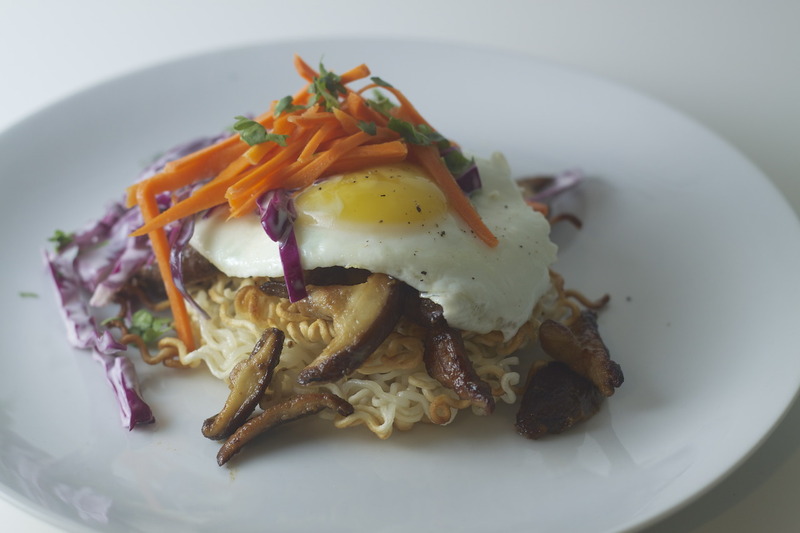 It starts to remind me of the food court of my hometown mall but with bigger lines and more attractive people), I decided to create my own crispy ramen bun at home. Instead of using the ramen as a sandwich, I used it as a base on which to pile other delicious things. Divide the ramen into four and fit down into a ramekin or other round container. 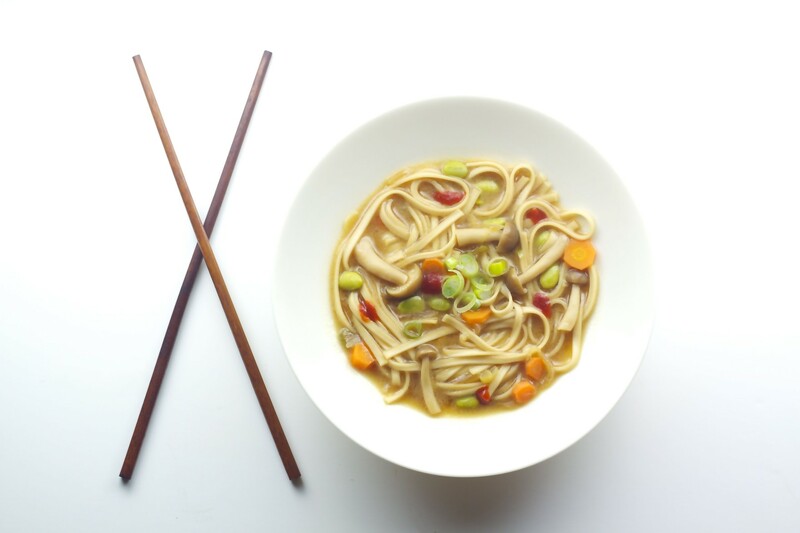 Use your hands to push down on the noodles and shape them. Cover and chill in the fridge while you prepare your other components. When you’re ready to fry, heat up an inch or two of oil in a pan. Remove the noodles from the ramekins (they may not hold their shape perfectly, that’s ok) and fry in the pan, flipping to crisp both sides. Remove from pan and drain on a brown paper bag. Whisk together the cider, sugar and salt in a bowl. Add carrots and toss. Cover and set aside until you’re ready to assemble. Whisk together mayonnaise and vinegar in a bowl. You may need to add more vinegar if it seems too thick. Add in cabbage and cilantro and toss to coat. Set aside until ready to assemble. In a bowl, whisk together miso paste, vinegar, honey and sesame oil. It should be a nice consistency (not too thick). In a saute pan, saute the mushrooms in a bit of olive oil and season with salt. Once they begin to brown up, add in the miso mixture a spoonful at a time and toss to coat. Continue to saute until the glaze has nicely covered the mushrooms. Butter a pan on low/medium heat. Add the egg (or eggs if you do all at once). Once the whites start to firm up, season with salt, remove from heat and cover. Keep an eye on the eggs. When the white is firm, they’re ready. Place a ramen noodle round on a place. Spoon a generous amount of miso mushrooms on top. Add the sunny-side up egg. Spoon on a fourth of the cabbage slaw and some of the pickled carrots. Top with more fresh cilantro if you’d like. Serve immediately. Hey! Like The Bored Vegetarian on Facebook!